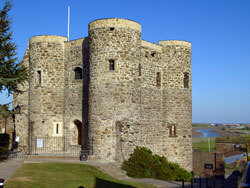 Rye Castle Museum is based on two sites, one in East Street and one at the Ypres Tower. The Ypres Tower is thought to have been built in the early 14th century as part of the town’s defences and is the second oldest building open to the public in Rye. (The oldest is St Mary’s church.) Exhibitions on both sites will appeal to children especially the Pugwash Treasure Hunt. John Ryan, creator of the Pugwash series lived and worked in Rye for many years. For details of opening hours and for an in depth history of Rye see the Rye Castle Museum website.